All it took for Ryan (right) to embrace the concept of meeting a player was for that player to be former long-time San Jose Shark Ryane Clowe (left). And you’d be correct — about Riley (although she was saddened by the news that her idol Martin Brodeur would miss the event after his father passed away on Thursday). It actually took some convincing to get Ryan to go. The issue was his schedule more than anything. Ryan, the consummate planner, was thrown off by my insisting he attend an early morning optional hockey practice. (Yes, I talked my kid in to going to a 6:50 a.m. Saturday practice, which felt … unsatisfying.) Ryan worried that he wouldn’t have enough time after hockey to do his homework, study for a pair of tests, and get in several games of our latest long-running backyard hockey series AND go to the Devils event. Now, there are times when I know the right thing to do is recognize my son’s concerns and find a way to work through them. This was not one of those times. I think it was when he said, “you’re making me go” to the Devils event that I cut him off. He laughed in the sheepish way he sometimes does when he realizes something he’s protesting is ridiculous, and he’s ready to throw in the towel and not continue the argument. I love the sound of that particular laugh. I knew the real appeal for him was the chance to play street hockey. He was somewhat indifferent about meeting the players, which came as no surprise. 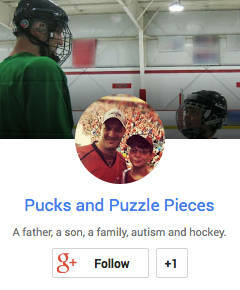 Ryan’s connection to sports is through statistics and results. He has a nominal favorite player (San Jose’s Joe Thornton) but he couldn’t tell me how many goals Jumbo Joe scored last year even though he knows how many shots on goal the Sharks had in every game. It’s just the way he connects to the sport, and that’s fine with me. Riley, by contrast, knows Marty Brodeur‘s birthday and his eye color and his kids’ names. They’ve both had the chance to meet players on occasion, and Ryan likes to ask them about their statistics, while Riley is somewhat more star-struck (when she’s not asking them about their summer hobbies). They both have autographed items. Riley can’t believe she’s touching something that a real-life player also touched. Ryan shrugs his shoulders. To him, autographs are just ink on a page (or a jersey, puck, or photo). Still, I wondered what would happen if Ryan ever had the chance to meet a Sharks player. Would he feel a greater level of excitement? Of connection? This offseason, the Devils signed a player, Ryane Clowe, who spent most of his career with San Jose. Would Ryan want to meet him? When the players emerged and began to walk the concourse, mingling with fans for photos and brief conversations, Riley set off to find her favorites. 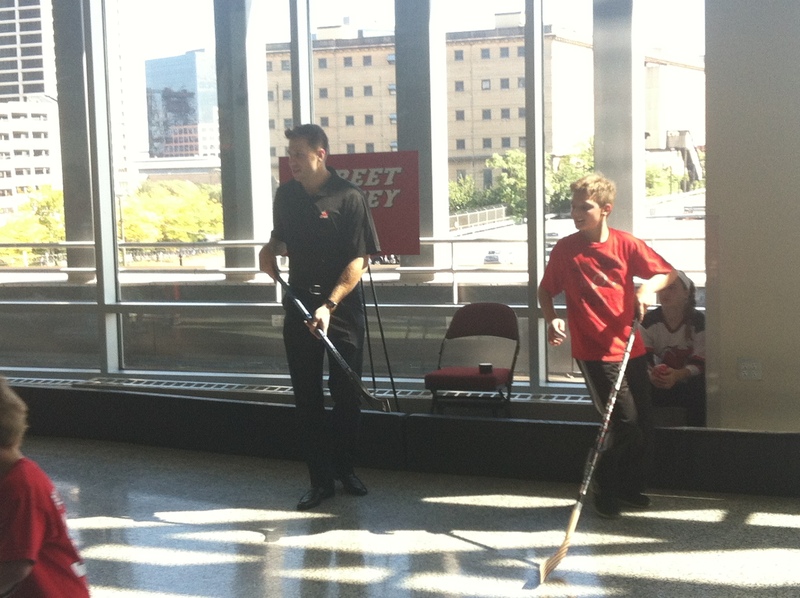 Ryan remained on the street hockey “rink” where he had been since our arrival more than an hour earlier. He was drenched in sweat, and wearing and ear-to-ear grin. When Veronica spotted Clowe on the concourse, she tried, in vain, to get Ryan to abandon street hockey for a few minutes and go take a picture. She told Ryan he could tell Ryane about how he loves the Sharks, has a Sharks-themed room and recently had a Sharks birthday cake. Veronica pulled up the photos on her phone to show him. But Ryan refused to budge. Veronica and I looked at him, and each other, and said the same thing. Who cares if he doesn’t want to meet the players and take pictures? He was in his environment, at an NHL arena, surrounded by nothing but hockey fans, and having a great time. We left Ryan at the rink and went off with Riley to find more players. When we returned, nothing had changed, except that Clowe was now posing for pictures just a few feet away. Veronica tried one last time to get Ryan to go meet him. Again, he refused. Just then, a funny thing happened. Clowe wandered over to the street hockey area. Despite wearing dress shoes and dress pants, he picked up a stick and decided to join the game. Nobody from the Devils asked him to do it. I guess it just looked like fun and so he jumped in. We pointed Clowe out to Ryan, and a look of amazement crossed his face. He went right up to Clowe to tell him how much he loved the Sharks. He grabbed Veronica’s phone and showed him a picture of his birthday cake. And then, he proceeded to defend against Clowe as best he could. Clowe stayed and played for at least 15 minutes. He laughed and smiled and set kids up for goals. He ripped a few shots past the goalie. He playfully “slashed” Ryan in the corner. He high-fived the kids and generally had a grand time. Ryan, far from star-struck, tried to guard Clowe all over the rink, all the while sporting an enormous grin. Would Ryan have had the same reaction if any of the other players — none of whom had played for the Sharks for the majority of their careers — had been the one to join the game? I suspect not. Sometimes the pieces all line up and fall into place just perfectly. This was one of those times. I knew it was a day Ryan would always remember. You know what else I learned? The other times he has met players made an impact, too. I know this because on our walk back to the car, Ryan recited each player he’d met over the last three or four years — their names, the circumstances, what type of interaction they’d had. It’s another reminder not to assume that Ryan’s exterior expression is all there is to him. I swear that kid is just too lucky sometimes. Maybe Clowe can come to next years birthday party…pretty sure it will be Sharks themed, too. Well I suspect once he’s had a full year of indoctrination into the “Devil Way” he won’t even remember he played in San Jose. And yes, Ryan is lucky. But I also think he pays it forward with his absolute, pure love of the sport and gets paid back in spades.